When I started researching the origins of this cookie, I found that this type of cookie is common to most cultures and didn't originate in Mexico. The cookie is based on an old recipe, and is used in most cultures for celebrations, since it's rich in butter and nuts. In Mexico, it's traditionally used at weddings and christenings which is probably how it got its American name. The dough is stiff enough to work with right away or if you prefer, roll them into balls and freeze them. The raw cookies can go straight from the freezer to the oven, just add 2 to 3 minutes to the original cooking time. Spread the pecan halves in a single layer on a cookie sheet. Place the pecans in the oven for 8 to 10 minutes or until lightly toasted. Remove from the oven and reduce the oven temperature to 325 degrees. After the pecans have cooled to room temperature, place them in a food processor and pulse until the pecans are finely ground. Scoop them into a large bowl and add the flour, salt and cinnamon. Stir to combine. In a mixer, cream together the butter and 1 cup sugar. Add the vanilla and the flour mixture and mix until well blended. Using 1 tablespoon of the dough per cookie, roll into small balls. Place the cookie on an ungreased cookie sheet and bake for 18 to 20 minutes or until lightly brown. Once the cookies have cooled completely, roll them in the powdered sugar. COOK'S NOTE: I used a small scoop, sometimes called a cookie scoop, to portion out the cookies. Check out the December 2009 newsletter for more information on what type of scoop I recommend. My mother and grandmother used “Monteca” instead of butter, gives it a more authentic taste. it’s called manteca, which is lard. in case you didn’t know. My Abuelita, Mama and Tias used manteca because butter was not readily available to them in those days!! Gosh, I was so dissapointed in he catiness in the comments……. 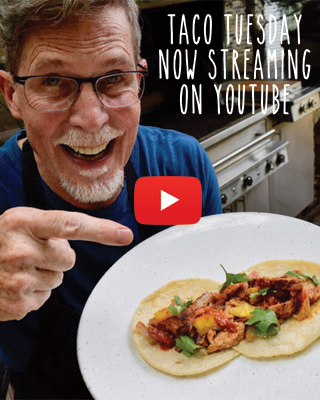 I’ll stick to watching and reading Rick’s recipes……love his love of this cuisine!.